We understand that choices, while wonderful, can potentially also be overwhelming. 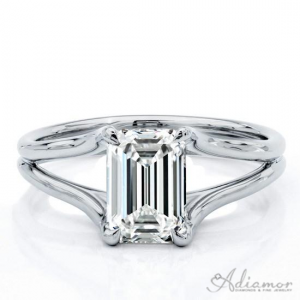 To help you make this life-changing purchase, we’ve compiled a list of our picks for the best Adiamor engagement rings of 2014 as represented by our unique and varied selection. 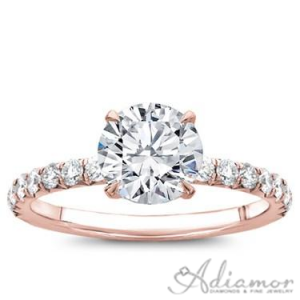 From cutting-edge trends to classic styles, these are Adiamor’s picks for the top 10 most gorgeous engagement rings. Follow the link to any ring in this post to create it as pictured, or mix and match the elements that are right for you! 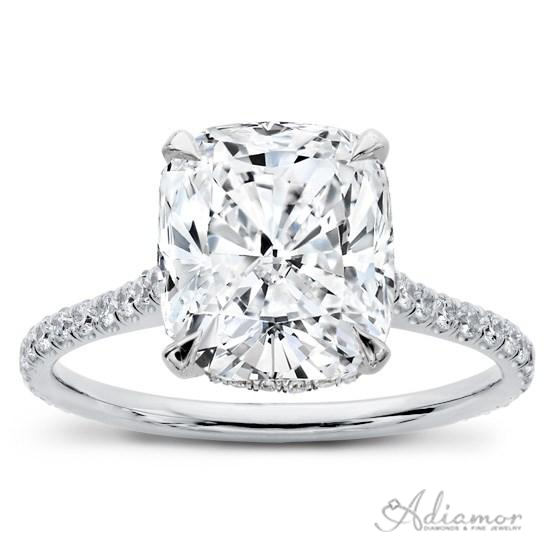 In terms of growing popularity, no other diamond shape can match the meteoric rise of the cushion cut. In just a few years, this shape transitioned from occasional retro styling to nearly outselling the classic round brilliant shape. 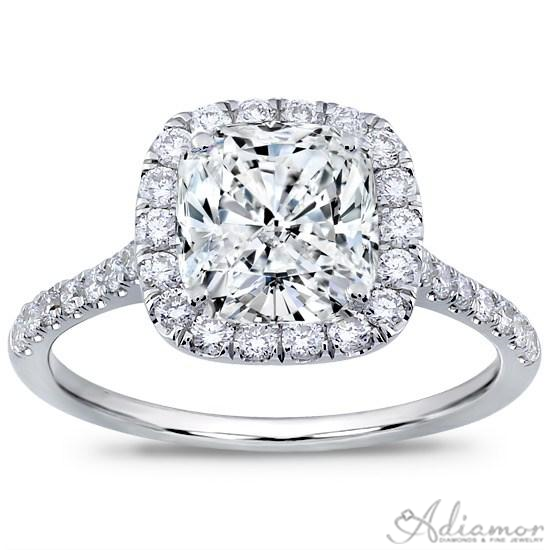 Paired with a round diamond accented basket setting in platinum, the cushion cut center stone is both secure and stunning. For an engagement ring that truly dazzles, no other style comes close to an elegant diamond accented halo setting showcasing a pristine cushion cut center diamond. Strong, shimmering white 14k gold provides the perfect backdrop for the bright white stones. Featuring nearly half a carat of round accent diamonds set in the band, halo, and underside of the setting, this design is quickly transitioning from vintage inspiration to contemporary classic. The perennially popular solitaire engagement ring gets a fresh new look when reimagined in 18 karat rose gold and featuring a fancy cut oval center stone. 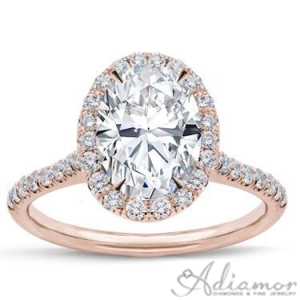 Adiamor offers this design in multiple metal and center stone combinations, but we love this version’s balance of the diamond’s cool gleam with rose gold’s signature warmth. Diamond accented engagement rings have an opulence all their own, and the combination of vintage elements such as the halo-ringed center stone and split shank platinum band in this design result in true luxury. The choice of a fancy cut oval center diamond sets this style apart from more common designs featuring a round center diamond. 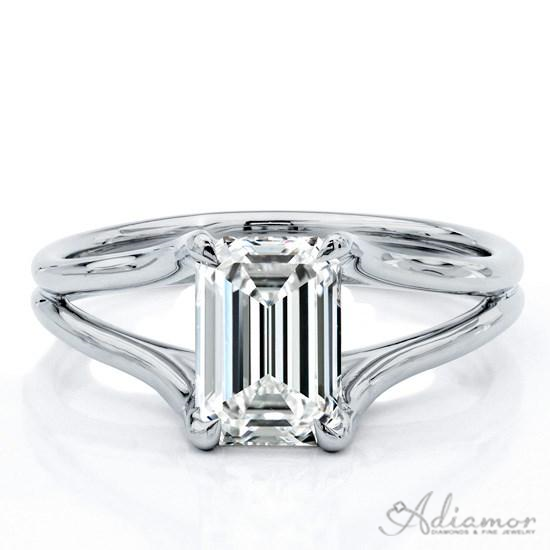 Above, we offer yet another take on the Art Deco-inspired halo engagement ring set with an elegant cushion cut center stone. 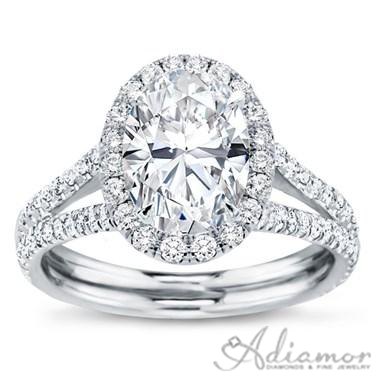 This design features approximately 100 round accent diamonds lining the exquisite halo and split shank setting. 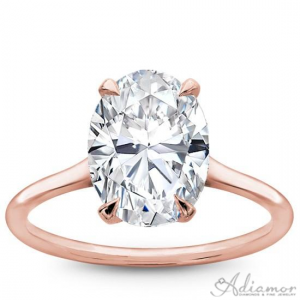 Elegant 18 karat rose gold is among the fastest emerging modern jewelry trends. Expect to see more of this lovely, distinctive metal option in 2015 and beyond, and stay ahead of the curve by pairing it with an oval fancy cut center diamond in a French cut halo setting. Accent diamonds on each side of the delicate band complete this eye-catching look. Few comparably simple designs have the stylish staying power of the classic diamond solitaire, and no list would be complete without this most traditional of engagement rings. 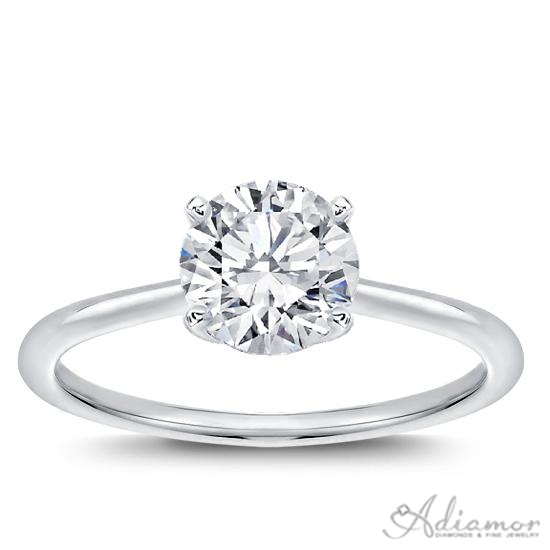 A perfect round brilliant diamond crowns the slender 1.7mm band of this mainstay style, available in four prong or six prong settings. Thanks to the rarely utilized trillion cut accent diamonds flanking a breathtaking cushion cut center stone, this design possesses both a vintage sensibility and a modern flair. 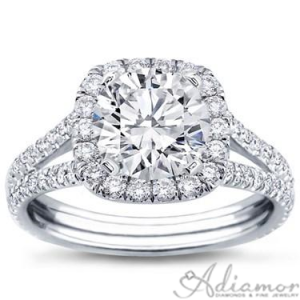 Three stone rings are becoming more and more popular as engagement and anniversary rings by virtue of the past-present-future symbolism often attached to the style. Subtle glamor abounds in this diamond accented basket setting, shown here in 18 karat rose gold with a round center stone. In addition to the more immediately obvious round diamonds accenting the band, delicately set stones also adorn the edges of the fine basket setting, rendering this design absolutely breathtaking at any angle. Clean lines and disregard for convention are the hallmarks of this stand-out style sported by none other than Beyonce; the unpredictable star managed to keep her 2008 wedding and 2014 album under wraps even while turning heads with her spectacular 18 carat emerald cut diamond engagement ring. 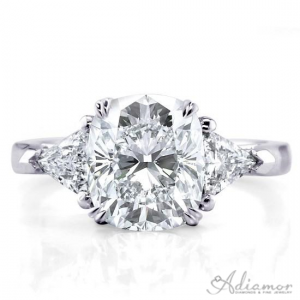 Because Adiamor’s engagement rings are made to order for each individual wearer, your possibilities for custom fitting and styling are almost endless. Before the process of choosing the right center diamond in one of our fancy cut or traditional diamond shapes begins, the extensive customization options for each style in multiple precious metals and setting styles makes it easy to create a unique piece that the wearer will fall in love with. For assistance in creating the ring of her dreams, contact us today! ← Diamond Eternity Ring Sweepstakes Winner Alert – Congratulations Gloria Sanders!